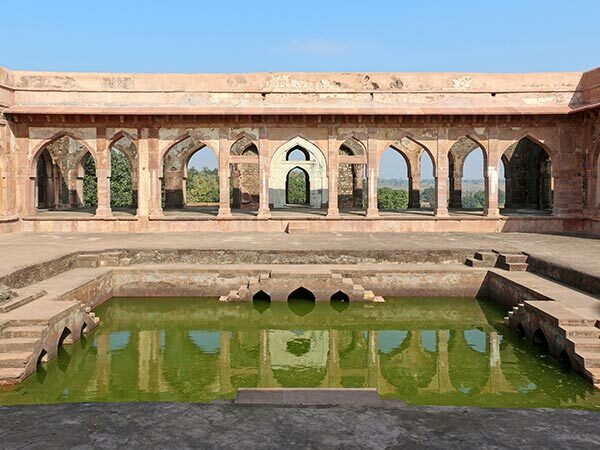 Located in the Malwa region of Madhya Pradesh, Mandu has been a well-established city since ancient times. Home to nearly every great kingdom that once ruled central India, Mandu was also a celebrated strategic location in the medieval times connecting the Deccan Traps. A display of fine architecture of the Afghan reign, Mandu also stands as the mark of Rajput glory that is well attested by the numerous palaces dominating the city. The strategic location of Mandu and natural defences of the Vindhya Range made it acquire an important place in history. It had been an important military post and that fact is reflected by the gauged circuit of battlemented walls which is punctuated by 12 gateways. The enclosure of the wall houses a number of palaces, Jain temples, mosques and other 14th- century buildings. The finest of all is the Jama Masjid that displays a magnificent example of the Pashtun architecture. Summers in Mandu face the wrath of the sun. Mercury rises to 44 degree Celsius and thus, sightseeing and travelling might get uncomfortable. It is best recommended to visit Mandu in winter from October to March. Winters are cool; however, mornings can get chilly, so always carry a pair of extra woollens. Mandu is located in the Dhar district of Madhya Pradesh and is roughly 380 km from Ahmedabad. There are two primary routes to reach Mandu. Route 1 is shorter than route 2 and exhibits a comfortable ride along the national highway. The state highway suffers from frequent construction works and might be a tedious and bumpy ride; therefore, route 1 is recommended. The routes pass through populated towns and therefore, there is less worry about the fuel. However, traffic can be uneasy sometimes. It is recommended to travel in the early morning to avoid the rush of passenger vehicles. Balasinor is located about 90 km from Ahmedabad. The small town was once the hub of commercial activity during the Yousafzai Pathan dynasty and thus, keeps its ancient architecture intact. Balasinor is also known all over the world for its fossil discoveries. There is a fossil park at Raiyoli village replicated on the Jurassic lines. Eggs and other unearthed dinosaur fossils are on display here. Sightseeing at the park might take half a day so it is better to plan the visit ahead. Other sites to visit include the Ambaji Temple, the Garden Palace and the natural hot water sulphur spring of Timba Tuva. The spring is the site where Bhim is said to have married and the rocks well preserve his footprints attesting the mythological folklore. A two-hour journey from Balasinor, covering 119 km, will bring you the ancient city to Dahod. It is this place where the Mughal Emperor Aurangzeb was born. Dahod is located on the banks of river Dudhimati. It is a rural place mainly inhabited by tribals of the Bhil community. The Devzari Mahadev Temple is located near the highway and is an ancient Shiva temple, flocked by devotees round the year. Stretches of vast greenery cover this entire place. The Mangadh hill is a pious place for the tribal sect. The entire area along the hill is covered in green luscious vegetation which instantly rejuvenates the mind and body. The place is calm and is surrounded by dense tracts of forests. The Ratanmahal Sloth Bear Sanctuary is located nearby and is well known for its flora and fauna. 86 km ahead from Dahod lies the 300-year-old ancient city of Rajgarh. The Narsinghgarh town of Najafgarh has a beautiful lake and an old fort nearby. The Baijnath Mahadev Temple gives a picturesque image with panoramic views of lakes filled with limpid water. The lush green grass races down the hills alongside small streams; all this makes it feel like a murmuring countryside. 82 km ahead of Rajgarh lies Mandu. The ancient city boats of man-made architecture that stood the test of time and still stands fortifying the entire city. With beautiful places and glimpses of Pathan architecture style, this is one of the few places in India which tell the tales of Islamic valour alongside Rajput glory. The sandstone structure initially built as an army observation point is now called Roopmati Pavilion. Baz Bahadur's love, Rani Roopmati, is said to have lived here. It is situated above the Narmada river which the queen revered during her reign. The 16th-century palace has large courtyards will huge halls and high terraces. The architecture is worth a view displaying the royal grandeur of the king. Rewa Kund is a reservoir that supplied water to Roopmati Pavilion. It is believed to be constructed by Baz Bahadur and is an architectural marvel. Darya Khan was Mahmud Khiji's minister. His tomb had a mosque, a pond and an inn. Made of massive sandstone, the Hathi Paga Mahal is also located near the complex and is crowned with a massive gorgeous dome and intricately carved walls, displaying Islamic methods of architecture. Dedicated to Lord Suparshvanath, the teerth belongs to the Shwetambar sect of Jainism. It underwent expansion in the 14th century while the idol of Lord Suparshvanath is believed to be much older. The idol sits in the Padmasana posture and ruins of many other idols are located nearby. Legend says 700 Jain temples were once situated here. This is India's first marble structure. The mausoleum of Hoshang Shah is a refined example of the Afghan architecture. It has intricately carved marble work and porticoed towers. This place is said to have served as the template for construction of Taj Mahal. Jahaz Mahal is located between two man-made lakes. It appears as a ship floating in water. It served as harem for the Khalji sultan. The place is known as Swing Palace for its sloping walls. Constructed during the reign of Hoshang Shah, the Hindola Mahal was once used as an audience chamber. It reflects the rich and glorious past of the royal dynasty. The royal palace near the Hindola Mahal consists of the Tawili Mahal along with the Nahar Jharokha.